Pour soda, lemonade concentate and water into a medium saucepan. Sprinkle with the gelatin and allow to soak for a minute or two. Heat over low heat, stirring constantly, until gelatin is dissolved (about 5 minutes). Remove from heat. Stir in the vodka and melon liqueur. Pour into a standard 1 lb loaf pan (glass or non reactive metal) and refrigerate until fully set (about 4 hours). To serve, cut into 1 inch squares. Garnish with edible gold leaf, if desired. Throwing or attending a St. Patrick’s Day bash? Looking for an alternative, or a celebratory supplement, to the standard St. Patrick’s Day green lager? Try a batch of Lucky-tini Jelly Shots! Whether cut jiggler style or served in a traditional paper cup, Lucky-tini Jelly Shots are always a crowd pleaser. The Lucky-tini Jelly Shot’s liquid cocktail inspiration is a Pear Melon Martini (but look at it, in its green glory – it was begging to be renamed! ), a mixture of pear flavored vodka, lemon lime soda, lemonade, and a touch of melon liqueur which provides the jelly shot with its unmistakable verdant hue. This recipe was first featured on the Jelly Shot Test Kitchen blog last year on St. Patty’s Day, and it has been a top draw ever since. My first aim when creating a jelly shot is to make a true-to-the-cocktail translation. In this case the cocktail inspiration, the Lucky-tini/Pear Melon Martini (as you will), is a very drinkable but extraordinarily high-proof booze-fest, a fact I made note of in the Jelly Shot Test Kitchen blog’s recipe notes. However, reader comments indicated a degree of surprise when the finished jelly shots came out kind of boozy! So, in this jelly shot rendition, I took the liberty of dialing back the vodka a bit (1/4 cup) and replacing with more soda. Feel free to go the other way if you wish! 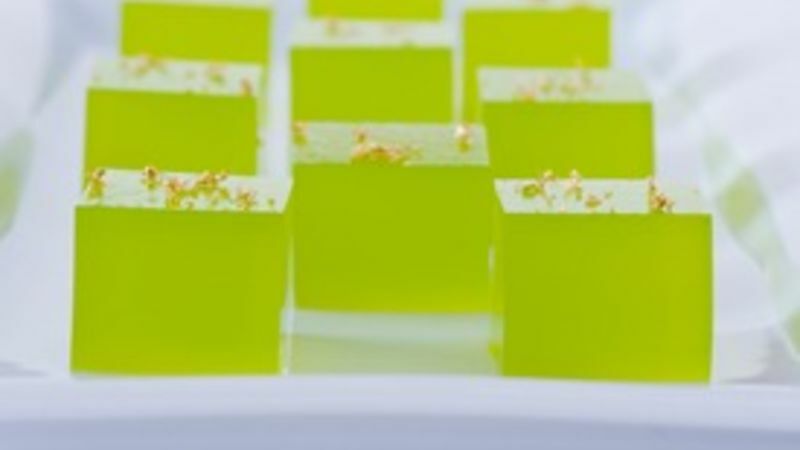 Hope the Lucki-tini Jelly Shot adds a dash of Gaelic cheer and frolic to your celebrations!